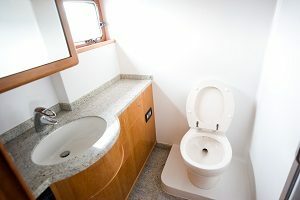 If your guest bathroom is too small, then here are some suggestions for how you can make them feel larger than before. As the holidays approach, you’re bound to spend more time with family. Let’s say you’re having friends and family stay for the night, or for the next few days. This could be easier said than done. If your guest bathroom is too small, then here are some suggestions for how you can make them feel larger than before. Think about the color scheme and the lighting that you use in your guest bathroom. When you use paler, softer colors, it helps trick the brain into thinking that the room is bigger than it is. Creams, whites, greys, and pastels also imbue the room with a feeling of serenity. This means that you shouldn’t use stronger colors on the walls, but feel free to do so with the accessories you put into your redone bathroom. The next step is to assess what your vanity looks like. If it doesn’t fit your vision, then get rid of it and replace it with something else. A standard-sized vanity can eat up most of the floor space in a guest bathroom. This, unfortunately, means that the bathroom feels even smaller than it already is. Instead, consider adding a pedestal sink. You can also have a floating vanity to open up more floor space. Mirrors are important parts of any bathroom. While your guest bathroom may be too small to accommodate a medicine cabinet, that doesn’t mean you can’t switch out the main mirror on the wall. Choose a new, larger, mirror to go over the sink. You probably never think about the tiles beneath your feet. Instead of multiple tiles, choose a floor design that features only one tile. Avoid adding a threshold to your shower stall; instead design it as a walk-in shower instead. If you have older guests coming over, or friends with limited mobility, they will thank you. Sometimes removing all the clutter in the bathroom goes a long way towards opening it up. Consider adding more shelving to your guest bathroom. Add some wall shelving, especially inset shelving. Then, all you will need to do is paint the shelves the same color as the walls around them. This entry was posted on Tuesday, November 13th, 2018 at 4:34 pm. Both comments and pings are currently closed.